Wow! What a busy term this has been! 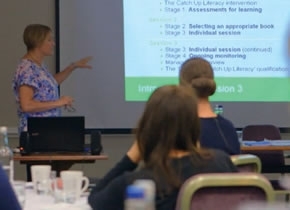 We have delivered more than 40 ‘Delivering Catch Up®’ training courses, welcoming over 500 attendees to the Catch Up® Community! In addition to this, we have welcomed back familiar faces to our ‘Review and Refresh’ training sessions and the Coordinator network meetings, and there have been some helpful webinars too! Our Accredited Trainers were pleased to visit some of our Regional Training Centres, schools and other venues across the UK! Courses took place in Essex, Manchester, Guildford, Bristol, Lanarkshire, Ayrshire, South Wales, Milton Keynes, London, Sheffield, Lincolnshire, West Dunbartonshire, Powys, Nottingham, Leeds, Birmingham, Durham and the home of Catch Up®, Norfolk! We haven’t stopped there this term! Our Catch Up® team have also been busy delivering training in Australia as well! We receive positive comments such as these regularly from our team. The motivation, enthusiasm and passion from course attendees is often witnessed, and is one of the reasons why our trainers enjoy being out on the road and meeting you all. They know what a difference you are all making to the learners you work with. These responses are echoed through the feedback we receive directly from course attendees as well. Across all of our courses, the average trainee response to ‘How would you rate the training course overall?’ was 4.6 (with 1 being ‘poor’ and 5 being ‘excellent’)! Our trainers are now planning some well-earned rest, but are very much looking forward to meeting more of you in the Autumn term!